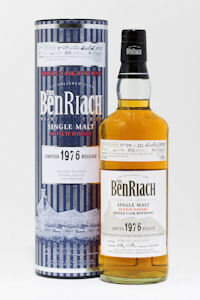 AWARD-WINNING BenRiach is issuing its latest batch of single cask bottlings this week. Available worldwide, Batch 7 maintains BenRiach’s reputation for encapsulating both perfection and rarity in a glass. The new release celebrates the sixth anniversary of the first bottling of BenRiach under its new independent owners. Back in August 2004, its ‘Heart of Speyside’ core range of 12, 16 and 20 yo malts became available for the first time. Fast forward six years, and Master Distiller Billy Walker has selected ten highly distinctive casks from 1976 to 1993 for BenRiach aficionados. These vintage malts are immense and full of character – from pineapple, coconut, honey, and spicy vanilla to treacle toffee, cloves and chocolate coated fruits. And the range of exceptional vintages is enhanced by their prolonged maturation in different casks – from a Virgin American Oak and a Gaja Barolo Finish to a Tokaji and a Peated Tawny Port Finish.